The Old Inn lives up to its name, with years of history dating back to 1614. These days it operates as a reputable hostelry-with-rooms, thanks to the efforts of long-serving owners the Rice family who have been in residence for more than two decades. Meals are served in the Gallery Restaurant and on the menu, there might be seared scallops with a cauliflower beignet and basil velouté, medallions of beef with mushroom ravioli and red wine jus or venison from Finneborough, plus desserts ranging from poached pear with star anise to rum-and-raisin trifle with honeycomb and white chocolate. The Above Steaks are Served with a Choice of Peppercorn Sauce, Béarnaise Sauce or Garlic Butter. 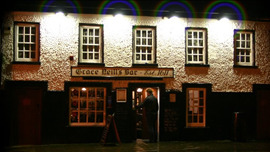 Dating from 1611, Grace Neill's proudly proclaims itself as 'Ireland's oldest pub'.